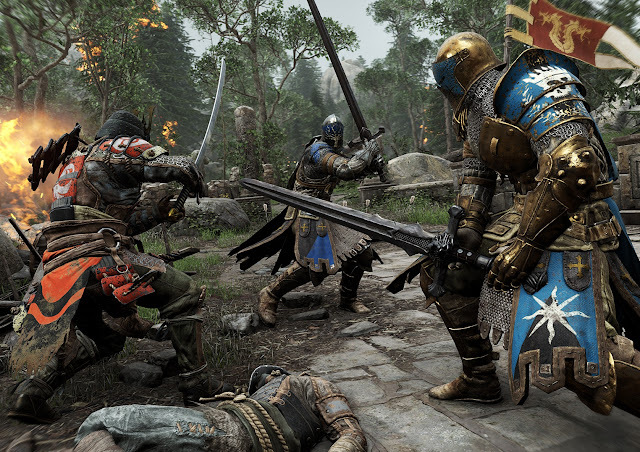 I’m going to say this upfront: I have real, deep, issues with how For Honor presents its characters and the narrative context for the game. The game promises us the opportunity to deal with that popular historical hypothetical puzzle of which warrior would win between a European knight and a Japanese samurai (and throws Viking warriors in there for good measure), but absolutely ruins the potential for those hypotheticals to play out. But I’ll leave that for the review, because I can go into it in-depth there. For this hands-on with the beta I want to say that the game plays really well, and people who are into the whole eSports and MOBA scene should get a real kick out of this; it is remarkably well put together for what it offers. At the start of a match you’ll pick one from of a handful of different kinds of heroes; some focus more on reach attacks (spears and the like), while others focus on heavy weapons and hard-hitting close combat. Then you’ll play across one of three different modes: 1 v 1 is a straight skill test between two players. 2 v 2 does the same thing, but if you’re able to defeat your opponent quickly, you can go and help your buddy out with his opponent, and you have to be really good at the game to defeat two against one odds. The main mode is the 4 v 4 though, and battles in this mode have a bit more depth. There are a couple of different battlegrounds to fight over, and these have different conditions, but my favourite by far is the MOBA-style one, in which peons also spawn and converge on the middle of the battleground to fight one another. In these battles, by killing the enemy peons, you can push the “front” of the battleground towards the enemy base and earn points in the process. The other goal is, of course, to kill the heroes of the other side. Just like in a MOBA, as the battle progresses, you unlock additional abilities that help you survive and fight better on the battlefield, and the addictive gameplay loop and grind kicks in; the team that is able to get ahead early has a distinct advantage in that their characters will be at a higher level, but at the start of each battle, everyone starts out even. One thing I did like is that player skill has a greater immediate impact than in a MOBA. When you square off against an opponent, you’ll be able to attack him or her from three different angles; left, right, and above. Your opponent can also defend (perfectly) one of those three angles. Meaning that if you’re really good at reading your opponent’s attacks, you can be almost impossible to hurt, even if your opponent has a higher level. There are a number of different abilities that break this up a bit; you’re also able to grab an opponent in order to break their defence, and different weapons are more effective against certain character types. For instance, I quite like the Japanese spear-wielding hero, who benefits from being fast and has reach with that spear. I have an almighty struggle, though, when I come up against an opponent with a flail, or other really heavy weapon, because they tend to beat me back and force me into a poor defensive position. That intriguing cat-and-mouse game doesn’t always seem to be there, because in the 4 v 4 battles, the maelstrom of action is incredible, and the visceral bloodletting and impact of attacks give the game a real sense of brutality beneath which you would never assume to find a subtle, tactical combat system. Which is, perhaps, why I'm quite enjoying myself, despite the aforementioned issues with some of the aspects of how it’s all presented. This is a major new IP for Ubisoft, and it’s clearly the company’s attempt to do something a little different with some of the more popular genres out there. I’m looking forward to seeing how it will perform. I suspect that there will be a real and lasting community for it. To conclude with a sidenote, however; if I have one wish for the rest of 2017, it’s that developers stop calling their pre-launch demos “BETAs.” For Honor releases in around two weeks. A BETA exists to give developers data and feedback to change their game ahead of a release. There’s so little that can actually be changed in two weeks that this is not a BETA. It’s a promotional activity designed to get people talking about a game before release, and it’s a closed “BETA”, limited to a small audience, in order to make those without it want in. I have no problem with any of this, but please can we call a spade a spade? That would be great.